Also known as Jinling snacks, Qinhuai snacks have a long history and a wide variety, enjoying a high reputation in the country. When Nanjing served as the capital in the Six Dynasties, local snacks were very popular. They have meat or vegetable stuffing, sweet or salty. They are so delicious that people will never get bored of eating them. The most famous ones are the eight kinds of Qinhuai incomparable snacks. 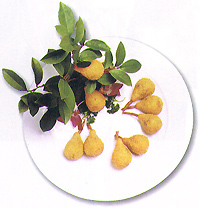 In the shape of a pear, Guantang Xiangsuli is an innovative snack with the Chinese and Western characteristics. Aromatic, sweet, glutinous and crisp, it has refreshing gravy inside. It is a famous dish of Jiangsu Province. With pressed fish meat wrappers, white and smooth, such wonton is stuffed with whitebait and white shrimps. Meticulously prepared, the women has tender stuffing and a delicious taste. So it is well received by customers, especially the elderly and the young. Pumpkin cakes attract customers with their golden color and a sweet glutinous and soft taste. Changzhou Caigenxiang Restaurant offers the most delicious pumpkin cakes. As a local snack of Changzhou, the golden coin cake is fried in oil, with a golden yellow color and in the shape of a coin. Hence the name. With crisp skin, the golden coin cake is soft, with delicious stuffing. Dipping in various kinds of sauce will make the cake more delicious. With a history of over 130 years, Longpao steamed dumplings filled with juicy crab meat used to be presented to the emperor as tributes. 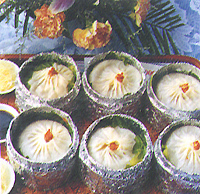 In September every year, such steamed dumplings attract customers from all over the country. Also known as salted porridge, Jiangnan eight-treasure vegetable porridge originated from Laba porridge (made with cereals, beans, nuts and dried fruit, eaten on the eighth day of the 12th lunar month). With red beans and green vegetables, such porridge is delicious with a faint scent, suitable for both the elderly and the young all the year round. White in color and beautiful in shape, the meat-stuffed buns served by Wangxingji Restaurant are especially delicious, salty with slightly sweet.